People say that love fades. And even my closest friend said that. And even my significant other did too. Does love fade? Does it? Well, I could not say that I do not entirely deny that. Even I used to say that love does fade at some point to some extent. The thing is, now that I have come to this point, I could say that I do not entirely believe that love does fade. In my humble opinion, no, love does not (entirely) fade; love just transforms. It could be partially or entirely, but I do think that love does transform at some point to some extent. The thing is, can we really control feeling? Can we control what we feel and whatnot? Do we have control of it all? When love transforms at some point to some extent, can we control what we feel regarding to that matter? When love transforms, do we have any control of it? People say that we do not have any control upon what we feel, yet we can control what we do about it. In other words, the control is not in the level of feeling, but in the level of act instead. When the love is not reciprocal, the feeling may be uncontainable, but we can bend through the decision we make upon our act. And here lies another problem: we must deal with the pain caused by the uncontainable feeling all by ourselves. The lyrics of the song I would like to discuss this time is a Korean song titled “Love You” It was recorded by the front-man of rock band, Buzz, Min Kyung Hoon for the soundtrack of tvN’s drama series, “The K2”. The power ballad track was released on October 22nd 2016 as a single album, “The K2 OST Part 4”. 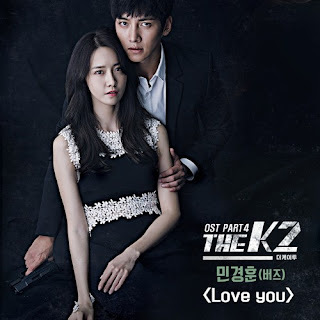 It was later released as a part of “The K2 Original Sound Track” album on November 11th 2016. This song served as a theme song for the lead characters couple in the drama series, Go Anna and Kim Je Ha, portrayed by Im Yoona (of Girls’ Generation) and (gorgeous actor) Ji Chang Wook, respectively. The visual couple portrayed a bodyguard (Je Ha) who falls for the one he has to protect (Anna). With all of the circumstances around them, Je Ha and Anna cannot just profess their love easily. However, that does not change their deep affection towards each other too. There are things that cause a love into being an unrequited love. However, it all comes down to one main problem: the fear to confess the feeling. The fear itself can be caused by some conditions that create a mental block; such as when someone falls in love with their best friend or when a bodyguard falls in love with their VIP, just like what happens in the drama series “The K2”. And when the fear consumes us, many negative thoughts follow to come, and the worst is the inferiority. We will feel like we lack of many things that we do not deserve to be with that person. We feel like we cannot do much that we are inappropriate to be with that person. We feel like we are inadequate to be with that person. Hence it all builds the mental block. Hence we feel like we cannot reach and catch that person. Hence it all builds the pain and hollow inside our heart. However, when the feeling is being left unsaid, how could that person be able to understand our feeling? No, they never could. All we do is just hurting ourselves instead.